Pours nearly jet black with a thinner quick to fade mocha colored head atop.Peanut butter and vanilla stand out in a fantastic nose,the peanut has a roast flavor to it,chocolate comes in as it warms,to me almost a hazelnut quality to it.There is more chocolate on the palate wich pairs well with the roasty peanut butter elements,it never gets too overly sweet.A really nice stout that has alot of different nuances not just over the top sweetness.Very well made. Charred malt. Light peanut butter. Purchased four different cans from this brewery for the artwork alone, this one in particular turned out to be a real treat, will get this again. Poured into a Fremont small snifter. Pours a very dark mahogany brown, appearing opaque black in the glass with a thin brown head that dissipates to patches and a ring around the glass with light lacing. Aroma of dark toasted malt, peanut butter and cocoa with a hint of vanilla. Flavor is dark toasted malt, peanut butter and light cocoa. Finishes with malt, peanut butter and a little char. Medium bodied with slight creaminess and sharp carbonation. A nice balance of peanut butter and malt, with light chocolate notes. Surprisingly light body for an imperial stout. The malt, peanut butter and cocoa flavors are quite nice and work well with each other, but the malt and additive flavors seem a bit dialed back. I liked the flavor of this, but wish it was more robust. Had on tap. Pours opaque, dark brown in color with 1/2 inch head. Taste is big peanut butter, cocoa, and roasted malt. Medium bodied, moderate carbonation and sweet. Makes for a tasty sipper. Plenty of peanut butter goodness. What could be better than combining chocolate, peanut butter, and beer? Well I wouldn't know because this beer didn't seem to accomplish that. Avdaek pour with a nice frothy head. Strong aromas of chocolate and peanut butter. So far so good. And that's where the good stops. It's not a bad beer but it's not that good either. It falls very flat. Very unimpressive and boring. Some gimmicks are just that. Comes in a pitch black color with a foamy beige head. Medium-poor retention, but a thin film always remains, leaving rings of lacing. The smell is sweet, like Honey Nut Cheerios or sweet cereal. Tons of vanilla, almond milk, peanut butter, and milk chocolate. Lots of honey and raw cereal grains as well. The taste is exceedingly sweet. Some milk chocolate, vanilla, hints of peanut butter. It really tastes more like Coca-Cola than beer. Extremely sweet. The mouthfeel is thin, but highly carbonated. Soda-like. It's even harshly grain on the finish, like there are actual chunks of peanuts floating in it. ...Yikes. I don't what went wrong here, but this is not a good beer. I am a fan of peanut butter. Thank you, Houser, for the opportunity to try it. Poured into a tulip glass at 47 degrees. A two finger head with poor retention is pitiful. A light tan creamy and foamy head. The beer is inky black with and not opaque. The beer reminds me of Peanut Butter Captin' Crunch. 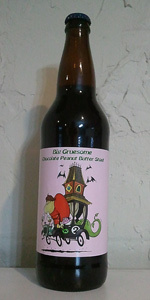 The aromas in the beer are peanut butter, chocolate, coffee, earthy, burnt sugar, dark roasted malt, bread, grain, and wood. The peanut butter feels forced into the beer. The initial flavors of the beer are coffee, chocolate, earthy, burnt sugar, dark roasted malt, grains, bread, and wood. The mouthfeel of the beer is water and dry. The body of the beer is medium, the carbonation medium, and a medium finish. I am sorely disappointed in this beer. It advertises as a double imperial stout, yet I find nothing in this beer that makes me believe that. The body of the beer is too thin, not chewy. The peanut butter is lacking within. I was expecting a thick and chewy beer with velvety notes of peanut butter, chocolate, and coffee. I did not get any of that in this beer. Pours dark brown color with a feint tan head. Smells of peanut butter and chocolate. Taste starts off with a light chocolate flavor and ends with a gooey peanut butter taste that sticks to your tongue throughout. I'm very impressed with this beer because, I have had a total of 4 chocolate/peanut butter beers and this one is definitely the best with the most peanut butter flavor. What a phenomenal brew.